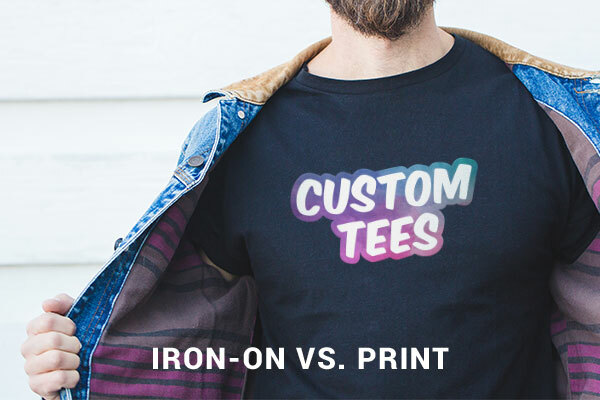 One of the most popular questions we get is in regards to our Custom Iron-Ons: Is it cheaper to order custom shirts or custom iron-ons? Obviously we would prefer our customers to order custom iron-ons from us no matter the occasion, but there are times when ordering custom shirts from a printer would make more sense. More than anything, we want to help our customers make the right choice so, here is a breakdown of when you should use iron-ons and when it makes sense to go to a printer. Note: about pricing: All of the prices include the cost of the shirt ($3.50). For print we used an average of the top 5 t-shirt printing services with 4-colors and for iron-ons we used a size of 4” x 5”. As you can see, if you need anywhere from 1 - 100 shirts then you would probably want to order custom iron-ons as you will save a significant amount of money, when you start ordering more than 100 shirts then you may want to consider a printer. The other factor is number of colors; for iron-ons there is no limit to the amount of colours you can print, whereas when you order a printed shirt, the more colors you use the higher the price will become (for 10 shirts with 8-colors you would be looking at about $20 per shirt). Although, if you are limited in terms of time then you still may want to consider a printer, even with the added cost but, if you have the time to spare you could save yourself a significant amount of money by ordering iron-ons. It is also worth noting that StickerYou offers die-cut iron-ons, whereas most iron-ons you would have to cut manually, so you are saving a lot of time compared to classic iron-ons, making StickerYou Iron-ons the best choice for many people. We hope this infographic was helpful and if you have any questions or want a quote you can reach out to our customer service team ([email protected]) or use our quick quote form. Happy designing!